The Kentwood Company once again led the market in luxury home sales in 2007 in Cherry Hills Village, Greenwood Village and throughout southeast Denver and the south suburbs. These statistics were released by John Fitzpatrick, Managing Broker of the Denver Tech Center office. The figures are based on sales of the entire firm for homes priced above $1 million. SOURCE: 2007 Metrolist Residential and Condo Closed sales by Listing Company – South Suburban East including Cherry Hills Village, Greenwood Village, Centennial, South Suburban Central, Douglas Highlands Ranch, Denver Southeast, Denver Northeast, Douglas County West, Douglas Elbert/Parker, Downtown Denver. Does not include: Boulder, Broomfield, Evergreen, Erie, Golden, Jefferson County, or New Home on-site marketing. The firm employs over 150 brokers in three offices including the DTC office, Cherry Creek and Lower Downtown. The average sales per agent once again was more than $12 million. That is almost 50% more than the next highest Denver real estate firm. This year the figures included the sales of homes listed by the firm as well as the market share of buyer representation for luxury home sales. The Kentwood Company represents as many buyers as listings in this luxury home price category. The company was founded in 1981 as a boutique firm serving primarily Cherry Hills and Greenwoood Village as well as other exclusive neighborhoods. It now grown to three offices but still enjoys the leading market share in these and other luxury home neighborhoods. It is one of the largest firms in Denver based on sales volume and takes pride in its local ownership. The Kentwood Company is affiliated with Leading Real Estate Companies of the World and LuxuryRealEstate.com. It operates it’s own relocation department assisting companies with relocating employee into and from the Denver area. Dad, You should update our readers about how those luxury home sales have slowed down now. It’s an important story that needs updating. Even homes in the $1m-$2m range are taking longer to sell and selling much slower than the homes I ususally sell under $500,000. 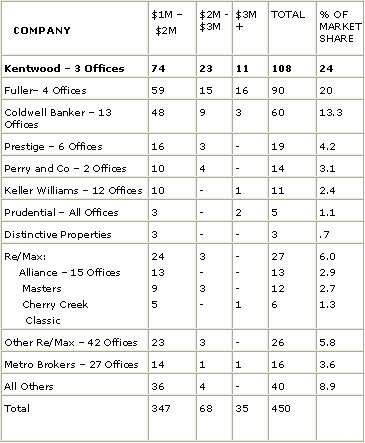 The Kentwood Companies statistics are always amazing, and are a reflection of each company’s strength as well as the professionalism and hard work of the agents. Elizabeth is correct in pointing out that the higher end segment of the market has slowed down this year. In Central Denver, homes over $1,000,000 are taking quite a bit longer to sell. We figure this may be the result of two factors: the lack of available loan funds combined with the expense of jumbo loans, as well as the sheer number of homes on the market. In the Cherry Creek area and surrounding neighborhoods, homes priced from $300,000 to about $800,000 are selling much more quickly.